Is privacy still relevant in the modern age? Is privacy still relevant in the modern age? That is the question being debated by Crime and Justice Research Centre researcher Dr Monique Mann and PhD Student Michael Wilson and Professor David Lacey. 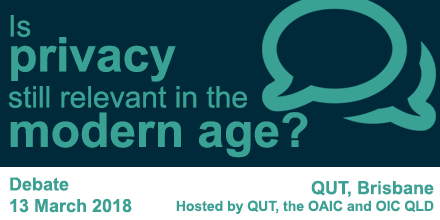 The OAIC’s Deputy Commissioner, Angelene Falk, will open the event, with the Queensland Privacy Commissioner, Philip Green, taking on the role of debate moderator. If you have been wondering about the relevance of privacy, register now to secure your spot. This event is co-hosted with the Institute for Future Environments at QUT.